The PalmInfocenter Forums have received a long overdue upgrade and facelift. The forum software has been upgraded to a modern system with many new features and options. Members can now easily add file attachments, avatars and images, bookmark and subscribe to threads, add friends and foes and utilize the convenient quick reply feature. 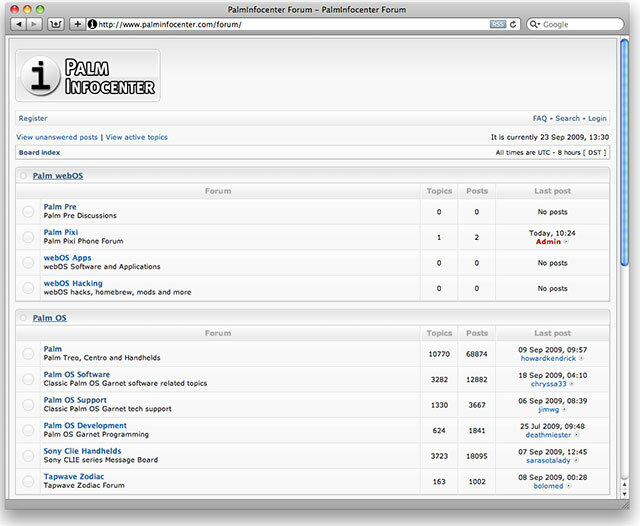 PalmInfocenter's forums have been online since the year 2000. The voluminous archive remains intact with a new interface that works well on both desktop computers and mobile devices. New forums have also been added for webOS including dedicated areas for the Palm Pre and Palm Pixi. Due to a change in the way user accounts are handled, existing users will want to read on to hear about the new options for posting and signing up. New users that wish to signup to post in the PIC forums can register for a forum account here. Due to the upgrade process, existing users who have posted in the forums before will have to request a new password from the forums, which will be sent to your email account on file. Once requested, the system will immediately email you a new password, which you can change via the user control panel after signing in. During the upgrade many older logins and inactive forum accounts have been pruned. If you attempt to sign in an are told "You have specified an incorrect username. " then you will need to register for a new forum account. We've also reorganized the sections based on platform and will be building out new features and boards as requested. Whether you are a long time member or a new Palm head, feel free to drop on by and introduce yourself. "voluminous archive remains in tact in a speedy and fresh new interface that works well on both desktop..."
and it says someone already has my name and email registered so I can't register the same name. hMM CAN't log in or register. Oh wait you are sending out a notice, which hasn't arrived yet.